Scottish Stained Glass can repair existing antique stained glass windows and also create new windows that replicate traditional antique styles. Older homes in Dallas often have antique stained glass in and around the front entryway, in hallways and stairs, as well as the dining room and study. 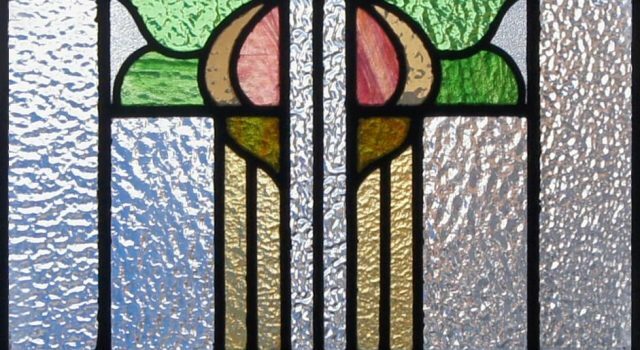 Many of these stained glass windows are built with beautiful beveled cut glass pieces or bright colors in the Art Nouveau, Art Deco, Floral and Mackintosh styles. Scottish Stained glass will work with home owners in Dallas and Ft. Worth to undertake the process of restoring the original windows, or in some cases to design brand new stained glass in the style of these original antique stained glass pieces. Restoring antique stained glass involves two separate processes. First, the lead is removed and all the glass pieces are cleaned to remove the decades of dirt, grime, smoke, and paint that has accumulated on the windows. Then, the window is releaded and reinforced to ensure that the glass pieces are being held securely in place and limit the impact of the elements on the window in the future. Manufacturing a new stained glass panel starts with a decision to either replicate the exact design which might previously have occupied a space in your home, or researching the age and architecture of your home to ensure that we are designing a window that is of the appropriate style. Often these antique stained glass windows are characterized by bright colors and patterns that mimic elements of nature. Leaves, birds, flowers and other organic elements are common in antique stained glass windows and at Scottish Stained Glass we always listen to the needs of our clients so whatever your preference is for design style we will always strive to accomodate your wishes.